What’s the first thing that comes to mind when I ask, “What are sidewalks for?” Many people would say for walking. Others would say for bicycling. Other would say they really don’t serve any worthwhile purpose and should be done away with. Jane Jacobs, in The Life and Death of Great American Cities, says, “Streets in cities serve many purposes besides carrying vehicles, and city sidewalks – the pedestrian parts of the streets – serve many purposes besides carrying pedestrians.” Jacobs main assertion about sidewalks is that they are the one thing that makes a city safe or unsafe. In her exact words, if someone says a city “is dangerous or is a jungle, what they mean primarily is that they do not feel safe on the sidewalks.” So what is it about sidewalks that make a neighborhood safe or unsafe? Jacobs says that circulation is the main purpose of sidewalks. They are intended and designed as an efficient way to get people around on foot. We all have been through neighborhoods with sidewalks that are unused. We also have all been through neighborhoods with sidewalks full of people. And yet again, we have all been through neighborhoods with no sidewalks in sight. 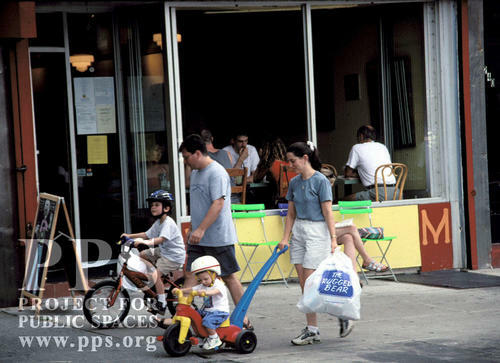 Jacobs proposes that neighborhoods with active sidewalk life are typically the safe neighborhoods, and those with nearly deserted sidewalks are the ones that are unsafe. How can we make an unsafe sidewalk safer? She makes two observations that one could propose to accomplish this: 1. to add more police presence, and 2. to spread the people out more thinly (as in the suburbs and as opposed to the city). Neither of these will work according to Jacobs. Adding more police presence will not make streets safer, because it does not address the root problem nor tap into the real power of making them safer. Adding police officers adds an artificial sense of safety. The real way a street is made safer is from an unconscious effort of its own residents and other occupants. The streets that are the safest are the ones where the occupants police the street on their own, not necessarily with conscious effort, but while going about their daily business. While they are walking the sidewalks, people tend to keep an eye on things. Streets where people do not use their sidewalks, such as in neighborhoods where people do not socialize with their neighbors, are those where crime is invited. The criminals know the streets where no one keeps a watch on the neighborhood, and those are the ones they target. It is assumed that suburbs are safer than cities, because the people are spread out. Jacobs gives the example of Los Angeles, which is a city that is so spread out, it could almost be considered to be one big suburb. If spreading people out were the cure to neighborhood safety problems, then Los Angeles should be safe. We all know that is not the case. Los Angeles’ crime rate is one of the highest in the nation for many reason, some of which are obscure, but we can say for sure that thinning a city out will not make it safer. There must be a clear distinction or demarcation between what is private space and what is public space. In suburbs, the lines between the two spaces are often times blurred. There must be people watching the street – people who live or work there and feel like they have a sense of ownership there. The buildings on the street – be they houses or stores – must face the street, not away from it. The sidewalks must have people using them fairly continuously. This will add to the effective number of eyes on the street and will entice those within the buildings to watch the street. Nobody likes to watch an empty street, and almost no one does. But if people were constantly walking by, more people would be willing to watch them. Many people enjoy people watching. They give people concrete reasons for getting out and going somewhere. They cause people to walk past the other places that don’t necessarily have any public use in themselves. Hence, these places then become routes to the other places. The business owner’s are very good at being unofficial sidewalk policemen, since the safety of the street has a direct influence on their business. The activity of people walking the street becomes an attraction for still more people to join in. It is almost self-perpetuating. Therefore, we see that creating a place where people want to and need to walk the streets to conduct business creates a place where people are safe. This is not a case of “which came first, the chicken or the egg?” It’s more of the case of the chicken and egg developing simultaneously. More public places to visit causes more people to use the street, which creates more public places to visit, which bring more people. The end result of this cycle is a safer, more usable, more desirable place for people. You’ll enjoy your visit to New York if you are interested in livable streets. You should check out http://www.streetsblog.org/ which I frequent often. I’m a huge advocate for reducing our dependence on cars (biking, mass transit, etc.) I was even partially into this when I was in Atlanta and took Marta to work most days.